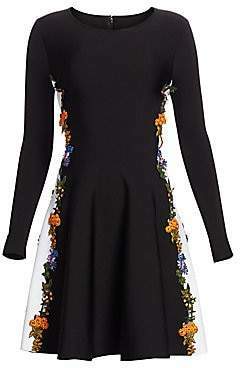 This LBD looks to nature for inspiration, with floral embroidery trimming white side panels for a figure-enhancing silhouette. 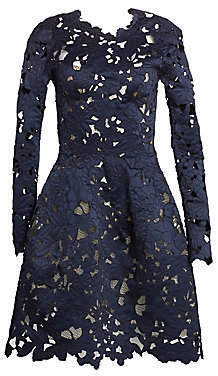 A kicky hemline contributes to the spirited feel of the piece. 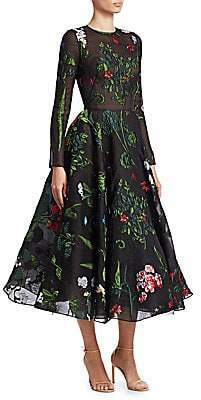 Roundneck Long sleeves with split cuffs Concealed back zip closure Viscose/polyester Dry clean Made in Italy SIZE& FIT Skater skirt silhouette About 37" from shoulder to hem Model shown is 5'10" (177cm) wearing a US size Small. 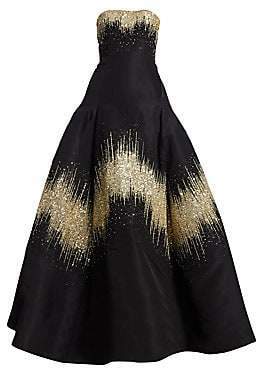 Designer Evenin - Oscar De La Renta. Oscar de la Renta. Color: Black White. Size: XS.